If the Grinch was a leftist, he might say, "Free speech is speech I can't stand in the least!" Let's face it, political correctness is primarily an effort to suppress free speech. Who are the biggest proponents of political correctness? Liberals, of course! They resort to labeling and name-calling, especially if someone holds to traditional Christian and Conservative values. If you point out that the Bible calls homosexuality a sin, you're a homophobe (a meaningless term used to provoke emotion; I don't phobe homos, or heteros, for that matter). If you point out the minority-status national origin of a criminal, you're a racist. Say that there are some things women just can't do, you're a sexist. Ban an obstreperous atheopath from trampling a Christian or creationist site, you're a censor (news flash, Skippy, you were banned for being an obnoxious buffoon, not for being a threat to our beliefs, and certainly not for using logic). Liberals rely on emotion and fear. When they have power, they use it with gusto. Post some of the aforementioned ideas on Facebook, you can get in trouble. 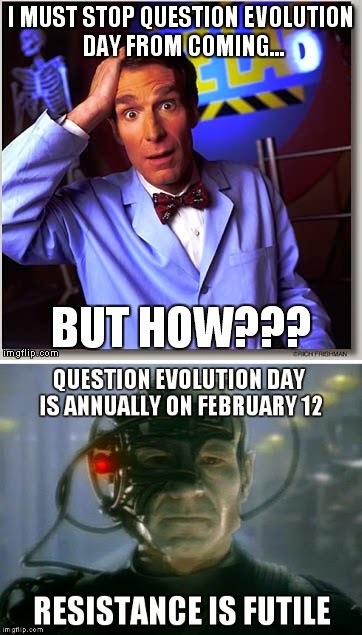 One guy posted something in an atheist-dominated "debate" group promoting Question Evolution Day, and was promptly treated like garbage and QED was thoroughly misrepresented (atheists almost always misrepresent creationists). Then he mysteriously lost his account. However, (warning, I'm not kidding here) this obscene graphic was not removed, it does not violate the so-called standards of Facebook. And that's very, very typical of Fazebook. There are still pockets of teh interweb where free speech still exists for Christians, creationists, and Conservatives. It is still a great equalizer, giving us regular folks a chance to express ourselves. But even that depends on various factors. We'll speak out while we still can. Doug McBurney is a Conservative Christian who has a podcast called "The Weekly Worldview". Politically correct? Not hardly! Doug will tell you what he thinks about the news, and tell you the truth about the left. He is also a creationist who supports Question Evolution Day. He'll make you think, enrage atheists and liberals, make you laugh, he plays rock and roll to make ironic points... Check out his current podcast at "Snapshots from the Bizarro World".